The British Army, comprising regular English, Scottish and Welsh regiments and the locally-recruited RIR, maintains a massive garrison across the Six Counties. A British garrison has been in place in the Six Counties since the enforced partition of the island in 1921. It has regularly been reinforced to stand at its current level of circa 19,000 soldiers. Its operational division of the Six Counties is mirrored by the RUC command structure. THE BRITISH ARMY has a total of 135 fixed military installations/structures throughout the Six Counties. Accurate figures are difficult to calculate and are deliberately disguised, but according to official British sources, the current overt strength stands at 19,000. Other various covert units and departments of the British Army, including the SAS, various signals regiments and Special Military Intelligence Units are also administratively located within Thiepval Barracks. Belfast Regional Command: Thiepval Barracks Lisburn (162). North Area Regional Command: Ebrington Barracks, Derry (163). South Area Regional Command: Drumadd Barracks, Armagh (164). These command areas correspond to the RUC Regional Command Areas of: Belfast Region; Rural East; Rural West. The British Army maintains a full operational presence in all of these and in the other Divisional and Subdivisional Commands, which are all in effect heavily-fortified military bases. Besides these joint operational bases, the British Army maintains a series of garrison and operational bases within their sole control. 163. EBRINGTON BARRACKS, Derry: HQ 8th Brigade, British Army. 164. DRUMADD BARRACKS, Armagh: HQ 3rd Brigade, British Army. 165. ABERCORN BARRACKS, Ballykinlar, County Down. 166. LISANELLY BARRACKS Omagh, County Tyrone. 167. PALACE BARRACKS, Hollywood, County Down. 168. ST PATRICK'S BARRACKS, Ballymena, County Antrim. 169. ALEXANDER BARRACKS, Aldergrove, County Antrim. 170. MAHON, Portadown, County Armagh. 172. BISHOPS GATE (MASONIC HALL) BARRACKS, Derry. 173. NORTH HOWARD STREET BARRACKS, Belfast. 177. BALLYKINLAR CAMP, County Down. 178. MAGILLIGAN CAMP, County Derry. 179. KINNEGAR CAMP, Hollywood, County Down. 180. LONG KESH CAMP, Lisburn. Many of these bases, although ostensibly belonging to specific regiments, are nonetheless used by units from different commands and by covert units of the British Army, including signals regiments and the Special Air Service (SAS). 182. JOINT OPERATIONAL HEADQUARTERS, Magheralave Road, Lisburn. 183. ROYAL IRISH REGIMENTAL HQ, Memorial Building, Waring Street, Belfast. 184. ROYAL IRISH RANGERS REGIMENTAL OFFICE, Sovereign House, the Mall, Armagh. 185. HOME HQ 5TH INNISKILLING DRAGOON GUARDS AND ROYAL IRISH HUSSARS Hydebank, Belfast. 186. STEEPLE ROAD BARRACKS, Antrim. 187. MAGHERAFELT RIR BARRACKS, County Derry. 189. SAINT ANGELO BARRACKS, Enniskillen. 190. SAINT LUCIA BARRACKS, Omagh County Tyrone. 191. MALONE BARRACKS Windsor Park Belfast. Many installations designated Territorial Army are in effect fully-operational bases for regular British Army regiments. 193. `D' SOUADRON, THE ROYAL YEOMANRY TA CENTRE, Dunmore Park, Belfast. 194 102TH ULSTER AIR DEFENCE REGIMENT, TA CENTRE, Crawfordsburn Road, Newtownards. 195. 40TH ULSTER SIGNAL REGIMENT TA CENTRE, Clonaver Park, Belfast. 196. 69TH SIGNAL SQUADRON, Clooney Park, Derry. 197. 4TH VOLUNTEER BATTALLION RIR TA CENTRE, Portadown, County Armagh. 198. 152TH ULSTER AMBULANCE REGIMENT/ROYAL CORPS OF TRANSPORT TA CENTRE, Sunnyside Street, Belfast. 199. 204TH GENERAL HOSPITAL ROYAL ARMY MEDICAL CORPS TA CENTRE, Fairmount, Antrim Road, Belfast. 200. 23RD SECURITY COMPANY TA CENTRE, Abbotscroft, Newtownabbey, County Antrim. 201. QUEEN'S UNIVERSITY OFFICER TRAINING CORPS, Tyrone House, Malone Road, Belfast. 203. 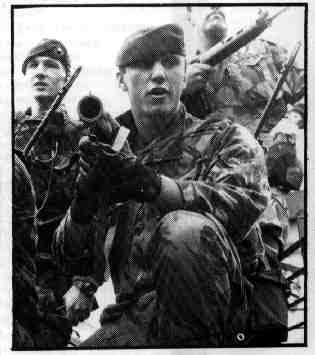 1ST CADET BATTALLION RIR, CAW CAMP, Derry. 207. WARD 19, Royal Victoria Hospital, Belfast. From 1985 onwards the British Army have bullt a wall of surveillance towers with attached bunker and garrison facilities which dominate the South Armagh landscape. These are serviced by helicopter and also provide a patrol and ground-control function for the British Army. 216, 217. SLIEVENABALA (2 POSTS). Outside of South Armagh, the border is ringed with massive fortified military bases which serve as permanent vehicle checkpoints. These bases also have an operational role in terms of patrolling the border area. 225. CAMELS HUMP, Strabane, County Tyrone. 226. CLADY VILLAGE, County Tyrone. 235. KINAWLEY VILLAGE, County Fermanagh. 237. BOA ISLAND, County Fermanagh. 240. KILLYMEELE ROAD, Dungannon: Attached to Killyman Barracks. Since the early 1970s, the British Army has blown up and blocked scores of roads linking natural cross-border communities. This policy in conjunction with the siting of permanent fortified border checkpoints and purpose-built British Army surveillance bases has effectively turned the entire border region into a militarised corridor. Listed below are the main blocked roads. 246. SIDE ROAD OFF GROARTY ROAD, Derry. 247. ROAD TO MILLBROOK BRIDGE, Derry. 248. ROAD TO GLEN BRIDGE, Derry. 249. ROAD TO HOLLYWELL HILL, Derry. 250. UPPER GALLIAGH ROAD, Derry. 251. ROAD OFF UPPER GALLIAGH ROAD, Derry. 271. CARN BORDER CROSSING, Tyrone. 294. ROWANTREE HILL CROSSING, Fermanagh. 295. MANGER BEG CROSSING, Fermanagh. 296. LOUGHSIDE CROSSING, Lough Melvin, Femmanagh. 314. LACKEY BRIDGE, (by-pass lane) Fermanagh. 322. CLOGH (CLONES) ROAD. Fermanagh. 323. CLOGH (INISHAMMON) ROAO, Fermanagh. 332. PEADAR FRANCIS' CROSSING, Tyrone. 333. JAMES CONNOLLY CROSSING, Tyrone. 336. MATT THE BAKER/HANGMAN'S TREE CROSSING, Tyrone. 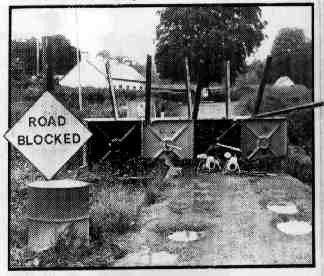 In addition to sealed border roads, the British Army/RUC have erected security barriers/blockages at every significant population centre within the Six Counties. These barriers/blockages are located in a total of 20 towns and cities (NIO figure). For purposes of clarity, these barriers which number several hundred are not specifically located on the map linked to this page. 341. LADAS DRIVE, Castlereagh, Belfast: The RIR and MI5 run an intelligence centre at this location. It also houses the main interrogation centre for the Six Counties. The intelligence centre was set up after the Hillsborough Agreement in 1985 to facilitate an intelligence role for the then UDR (now RlR). 342. ISLAND HILL, Comber: Functions as a GCHQ (eavesdropping) sub-base. 343. GILNAHIRK, Belfast: Functions as a GCHQ (eavesdropping) subbase. RAF flight staff operate at a large number of heliport facilities which are incorporated into operational British bases across the Six Counties. 345. RAF ALDERGROVE: The RAFs main operational base in the Six Counties. It sits adjacent to Alexander Barracks (169). A second RAF base currently in the process of decommissioning is RAF Bishopscourt. 346. 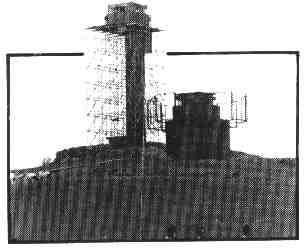 OXFORD ISLAND RADAR BASE: The main communications and radar facility for the Royal Navy. The Royal Navy also has facilities at several bases in the Derry, Antrim and Down areas. 347. CARLINGFORD LOUGH: The Royal Navy's permanent offshore battleship emplacement. The British Army has erected fortifications of varying size, from barriers and observation posts to permanment barracks, at all judicial buildings in the Six Counties. 348. CHICHESTER STREET, Belfast High Courts, British Army barracks.